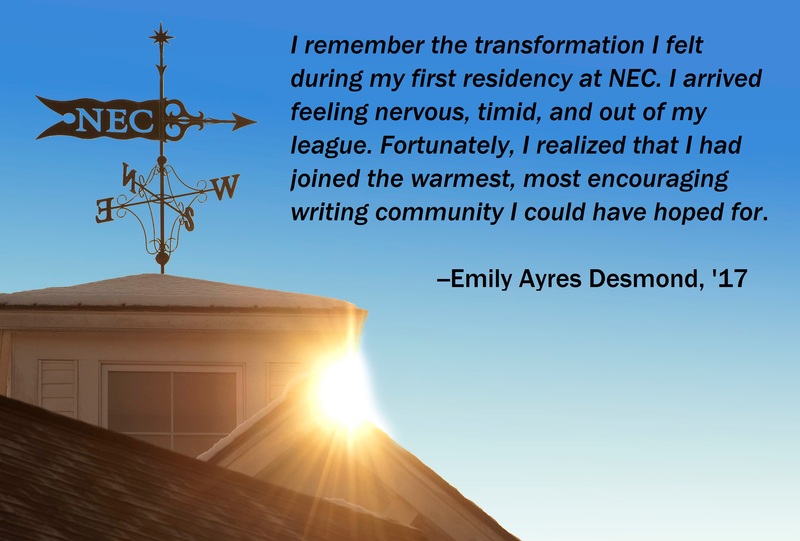 New England College’s Master of Fine Arts in Creative Writing program is a truly transformative learning experience for writers. The Master of Fine Arts delivers a rigorous, individualized program, with four dynamic degree tracks: Fiction, Nonfiction, Poetry, and Dual‐Genre. The MFA’s academic model is studio/research: integrating substantial work in the academic study and creative production of literary art. Students are individually mentored by accomplished, award‐winning faculty members who are among the most compelling writers in their genres, and who also are known for their excellence in teaching. Additionally, New England College’s MFA program is the first and only low‐residency program to offer Graduate Teaching Assistantships, providing students opportunities to gain relevant teaching experience for future academic careers. Students also have opportunities for specialized study in areas such as translation, cross‐genre writing/hybrid forms, editing and publishing, new media, and performance. Applications for both winter and spring residencies are accepted on a rolling basis, with preferred deadlines of May 1 for fall and December 1 for spring. Understand the history, theories, and movements that have shaped and continue to influence the writing, reading, and critical reception of literary works. Be able to locate your own writing in historical, theoretical, and cultural contexts. Be able to engage in rigorous critical discourse on your own writing and the work of others. Demonstrate a keen awareness of the writer’s craft and effective use of craft in your own writing. Apply what you have learned and practiced to the production of a substantial body of high‐quality literary work. Residencies are held in January and July on New England College’s beautiful campus in the scenic town of Henniker, New Hampshire. The program’s progressive pedagogy and comprehensive curriculum guide students’ individual development in the study, process, practice, and profession of creative writing. The MFA Program at New England College is the only low-residency program to offer Graduate Teaching Assistantships. Partially and fully funded assistantships provide students with a unique opportunity to gain pertinent teaching experience with a variety of courses and learning environments. Assistantships are available for online courses as well as campus courses during regular or summer terms, and are assigned based on the student’s geographic location, availability, and subject matter expertise.